That article is about The middle way. Over the years, my planted aquaria have evolved from undergravel filtration and tungsten lighting with a few common plants to high-tech set-ups with CO2 injection, low-voltage under-soil heating and the full German Dennerle/Dupla system. I have also used the low-tech systems with simply daylight, loam, silver sand and plants that act as natural filters. All work in their own way with different degrees of success. However, there is a middle way that’s easy and not too expensive to run. If you get the conditions right, it follows that the fish will thrive. 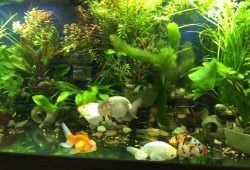 But there are some basic principles that must be followed: Even if you have the best equipment, you can’t work miracles and you could have problems with algae, plant growth and the fish. Water changes are often overlooked – I recommend 20-25% every two weeks to dilute pollution problems and add the nutrients necessary for your plants and fish and increasing the oxygen level. Don’t overstock. I recommend 2.5cm/1″ of fish per gallon. For more information on stocking levels, check out the stocking guide on this website. Most of my set-ups revolve around the Juwel tanks as they provide value for money, come with all equipment, have been designed for easy access, simple maintenance and are designed for the European love of the planted aquarium. There have been some exciting developments recently. Forget pea gravel, glass or marble chips – they provide no nutrients and no surface area for bacteria to colonise. 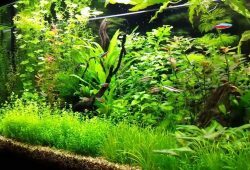 You will need to budget about ï¿½40 for your substrate. Most retailers will say that the fishkeeper is not prepared to pay this. However, the advantages of a good substrate are that your plants stand a much better chance of growing and your fish will benefit. You could also save in the long term on the cost of replacing fish and plants. Although the initial spend is higher for the quality substrate, over a year it becomes the cheaper option. I am getting very good results with the Eco Complete Planted Aquarium Substrate by CaribSea. It is the freshwater equivalent of live sand. It comes pre-washed with black water tonic and bacteria added. As a bonus, there is no need to waste time washing until it runs clean. It has additional humic material and the addition of bacteria speeds up the maturation process. However, the normal period of tank maturation of at least two weeks should be observed before hardy fish are added. Check nitrite levels to ensure it is safe to add fish. The organic material is beneficial to fish and plants and binds the heavy metals, reducing toxicity. I added it to my Angelfish set-up and within two days, they went into breeding mode, so the fish appreciated the black substrate and black water tonic. The substrate is clay based and very light. It has a honeycombed structure, which is ideal for bacterial colonisation, and the enzyme action enables the plants to extract nutrients. Carpeting plants can also spread through the substrate easily, which is not the case with pea gravel. It also has nutrients added for plant growth. Its only downside is that it is very light and if you do a vigorous water change, it creates large craters in the substrate. The tank with the Angels also has CO2, so it is not clear what causes the growth as I don’t have a true control. However, in a tank that has no CO2, plants such as crypts and vallis are thriving. The addition of CO2 speeds up the growth of plants. In the past I have struggled to keep the more difficult Echinodorus such as ‘Oriental’ and ‘Red Flame’ with lovely pink and white leaves at the back of the picture. But with a decent substrate and added CO2, they are thriving. I use the Carbo Plus Electrolysis system that uses carbon block. It retails for about £120, while a replacement block is about £15 and should last four to six months if linked to the lights and shut off during darkness. It is simple to use, but its one drawback is that it cannot be linked to a pH controller. This can alter the water chemistry, but provided you maintain regular water changes and test pH regularly, you can usually adjust and control this. While pH controllers make for a more stable environment, they are not essential and are expensive. If money is tight, don’t use them. Dosing is simply controlled by a turn of the knob altering the current rather than spending hours fiddling with the bubble counter to get the correct amount of CO2. Another useful new product is the Gold Label sealer. It is not a silicone but a polymer which sets instantly under water – a big advantage when sticking the black Juwel background to your tank. It also means you do not have to wait 48 hours before filling the tank. Another use is re-sticking the filters if they come adrift without having to drain the tank. It is a very useful product and worth hunting out. My system works well with Crypts, which are ideal for the novice and very under-rated. I also set up simple tanks using Anubias on either lava rock or bogwood. While they look stunning, remember that Anubias are slow growing so you will need to control the light through floating plants – four hours can be sufficient if there is natural daylight. It is also a good idea to have some fast-growing plants to strip out the nutrients such as vallis, Hygrophila and Ludwigia. If you want to have fun, you can grow Anubias on their own in natural daylight. If you have about 4 l./1 gal. 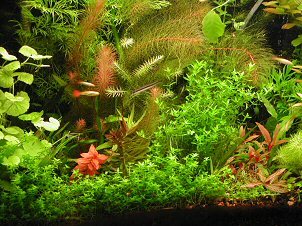 of water and floating plants, you could add a few shrimps, the ultimate in low energy and low maintenance tanks. If you have a problem with brown algae growing on leaves, try using an electric toothbrush. 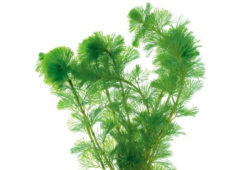 The rotation of the heads is sufficient to remove the algae, and as the leaves are pretty thick, it should not do any damage. Another super addition is Hydor’s Bio Flow Wheel, which can be added to any internal Juwel filter. This increases your biological filtration by leaps and bounds and keeps ammonia and nitrites under control and removes surface film – it may even help reduce nitrate. It moves slowly, so does not oxidise out nutrients or waste naturally occurring CO2. It is also very low maintenance. Choosing this middle route has saved me a fortune on equipment, conditioners, nutrients, under-soil heating, pH controllers and CO2 systems – and I still have a very successful planted aquaria. Why don’t you give it a go?